Within the fabric of a West Yorkshire church is a beautiful stained glass window commemorating a loving son and soldier – Lt. Maurice Nettleton Wilcock. Why is he remembered in such a magnificent manner when his name is not on the church war memorial which commemorates past churchgoers and local young men? Maurice Nettleton Wilcock has been remembered inside St Mary’s Church, Woodkirk for many years. When parishioners sit in the traditional pews do they look up and read the words remembering a young man or do they simply admire the beautiful colours when the sun shines bringing the glass into its full glory. How many members of the church knows who he was or why he is not on the memorial to the dead and missing. Let me see if I can find the answer! Maurice was the son of John Henry Wilcock and his wife, Mary Elizabeth nee Terry whom he had married on the 13th of November 1895 in the Parish Church, Mirfield. John Henry Wilcock was born in Ashton Under Lyne, classed a gentleman on his marriage documents, the son of Henry Wilcock, a leather merchant of Fairfield. While Mary of Royd House was the son of John Nettleton Terry a surgeon. John N Terry had been Gazetted in 1864 being a Surgeon in the West Riding Yorkshire Artillery Volunteers, resigning his Commission in 1872. He had before his service been in partnership with Edwin Casson, Surgeon and Apothecary, this partnership was mutually dissolved in 1858. The Gazette also tells that Terry was both surgeon and apothecary. Going back to Maurice, he was born on the 14th of June 1897 in Wilmslow, Cheshire and baptised in Mirfield on the 3rd of August 1897, a few days after the death of his father, who had died on the 25th of July in Mirfield. Maurice’s first census was that of 1901 when he and his mother were living at Wilmslow Park. His mother, Mary was aged 28 and living on her own means. Maurice was only three years of age being born in Wilmslow. Mary Terry, his widowed maternal grandmother was also in the household along with three servants – a nurse (domestic), a cook (domestic) and a housemaid, yes again domestic. Mary Terry, like her daughter, had also sufficient funds to enable a decent lifestyle, which is to be taken for granted after seeing the window. 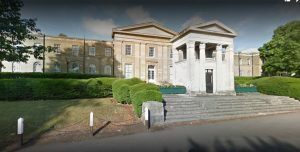 Ten years later and Maurice is now 13 years of age and a border at Radnor School, Redhill with six other pupils, two assistant mistresses – Zeta and Sybil Rougier from Guernsey and Head of the household Miss Mary Granville Johus (sic). Maurice also attended Mill Hill School, London. Mary Elizabeth Wilcock remarried solicitor Leonard Richard Brewer Phillips, whom she had married in Wales in 1906 and they appear in the 1911 census living at Bryancliffe(? ), Wilmslow, Cheshire, an eleven-roomed house. As well as Leonard and Mary, Margaret Terry was a visitor. The couple had a butler, Bertram Smith and two other servants. Maurice was one of over 300 Old Millhillians who gave their lives during both World Wars. He was Gazetted in 1917, given the rank of Lieutenant in the 13th Bn. Royal Fusiliers and in a short time would be serving his King and Country in a foreign land. 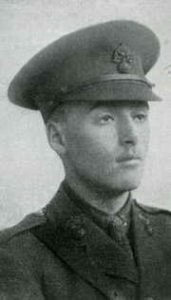 In September of 1918, Maurice’s battalion had been taking part in the Battle of Arras – he was killed in action on the 18th of September of that year. He rests in Lebucquiere Communal Cemetery Extention, on the road from Bapaume to Cambrai. The area around the cemetery had been retaken by the German army in March 1918. Being retaken by the allies in early September. The cemetery extension was begun in late March 1917 and used for almost a year, being enlarged again when burials from outlying areas were brought in from surrounding battlefields. The cemetery contains the graves of over 770 servicemen, of which 266 are unidentified – known only unto their God. 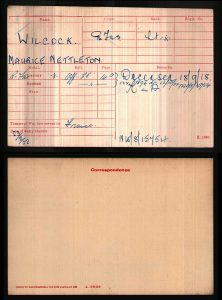 As with all WW1 Army Officers, Maurice did not have a service number, which can sometimes hinder research, The ranking soldiers had an identifying service number which is a boon when looking for similarly named men – that is unless a transcriber has made an error, not an unusual occurrence! The advantage of officers records is that they are held in the National Archives, sadly not online, but available for a fee. Anyway, back to records and memorials that appeared as a result of Maurice’s death. Maurice would have had money owing to him from the War Department, which his mother, as next of kin, would be eligible for. Firstly, the Army Register of Soldiers’ Effects lists that about £120 was forwarded to Cox and Co. (the same as many officers) before being distributed. Money in the family – Maurice’s maternal grandfather, died leaving £57,567 to his daughter Mary Elizabeth Phillips. Maurice, of Burdon Brown, Cheam, Surrey after Probate left £20,683 to his mother. Leonard, of Roydene, Gerrards Cross died in 1934 leaving £18,919 to his widow Mary Elizabeth. action on 18th September 1918’ (extracted from IWM memorials). The war memorial in Cheam also includes Maurice on one of its stone tablets. I said earlier he is also one of over 300 Old Millhillian’s from Mill Hill School who are remembered by a War Memorial Gateway made of Portland stone which records the names of the fallen on internal panels. The school memorial can be seen from the roadside standing proudly and slightly set back from a short flight of steps. The opening of the Memorial Gate was filmed and is available to view on Youtube. I would like to think that some member of Maurice’s family attended the opening ceremony. I have found various memorials that bare his name but as yet found no connection to St Mary’s Church, Woodkirk…………. Do you know any different? This entry was posted in General on March 27, 2018 by carol.